President Donald Trump has put Commerce Secretary Wilbur Ross out to pasture. One problem: Ross’s efforts to wheel and deal with the Chinese have left the president unimpressed. Another problem: He keeps falling asleep in meetings. Early in Trump’s presidency, Ross was his go-to negotiator, helming the administration’s trade talks with the Chinese. After a few months, though, Trump concluded he was doing a terrible job. In a series of Oval Office meetings about six months into his presidency, Trump eviscerated Ross, telling him he’d screwed up, and badly. Trump told Ross he didn’t trust him to negotiate anymore. Ross had tried in the early months of the administration, before Robert Lighthizer was confirmed as the U.S. Trade Representative, to take the lead on several crucial trade conversations. Once Lighthizer arrived there was a tussle for control over several issues. But after Ross botched — in Trump's eyes — his dealings with China, he decided Lighthizer would be the lead negotiator on all trade issues. During this period, Trump humiliated Ross in front of his colleagues, per three sources, and questioned his intelligence and competence. The Financial Times reported in August that Trump rejected a China steel deal that Ross thought he’d closed. But nobody has reported the extent of Trump’s castration of Ross. Trump has effectively taken his Commerce Secretary — who he once called a “killer” — off the playing field. One example: Ross made a deal to open the U.S. market to cooked Chinese chicken, in exchange for the Chinese opening their market to American beef. 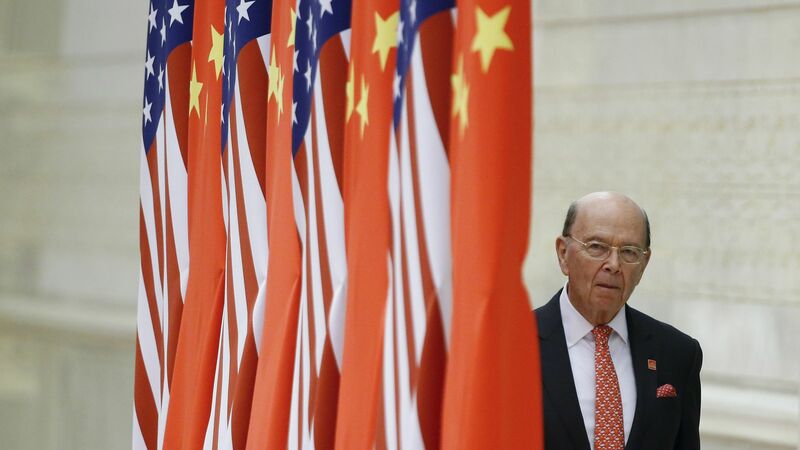 Ross told reporters it was a “herculean accomplishment,” and “more than has been done in the whole history of U.S.-China relations on trade,” per the AP. But Trump wasn’t impressed with this deal — at all — and told our sources he found Ross’s boasting to be laughable and ridiculous. Ross’s propensity to doze off in meetings — which senior Capitol Hill aides have noticed — hasn’t helped. Why this matters: Ross entered the administration as one of Trump’s favorites, poised to be a power player. Trump has known Ross since the bankruptcy tycoon helped keep him financially afloat in the early 1990s. Trump was proud that Ross — this billionaire Wall Street legend — wanted to work for him. The current status: Ross bottomed out with Trump midway through last year. Since then, Ross has spent months trying to rebuild alliances within the administration, courting his colleagues over dinners, but he’s never fully regained his stature in Trump’s eyes. However, he is in a much a better place with the boss than he was in July, and remains an active participant in the weekly trade meetings. He'll be a primary player in the debates over possible steel and aluminum tariffs and recently hand-delivered reports to the president on the national security findings on both metals. But sources close to Trump say he’ll never again trust the 81-year-old to be his “killer” negotiator. The recent Forbes article — revealing that Ross vastly exaggerated his net worth — did not help his internal standing. “Wilbur’s been sucking up for months, trying to get back in the president’s good graces,” said a source close to Trump. He's got a way to go. 2. Scoop: Jeff Sessions urged FBI boss to make a "fresh start"
Attorney General Jeff Sessions has adamantly urged FBI Director Christopher Wray to make a "fresh start" with his core team, including replacing deputy director and Trump bête noire Andrew McCabe, according to a senior administration source. According to this source, and two other sources briefed on the conversations, Sessions has been strongly urging Wray to do this for some time. Another person Sessions thought should be cleared from the core team: the FBI's top lawyer James A. Baker, who was "reassigned" in December. "The conversations about McCabe and the core team started shortly after Wray was confirmed," said the senior administration source. "They intensified from there." The New York Times — and others — reported in December that McCabe "is expected to retire after he becomes eligible for his pension [in] early ." But senior Justice officials are still not sure what McCabe plans to do. An FBI spokesman declined to comment when presented with the facts in this story. Trump and other Republicans have been hammering McCabe for months on Twitter. On July 26, Trump tweeted: "Why didn't A.G. Sessions replace Acting FBI Director Andrew McCabe, a Comey friend who was in charge of Clinton investigation but got...big dollars ($700,000) for his wife's political run from Hillary Clinton and her representatives. Drain the Swamp!" Ironically, the White House chose McCabe to be acting director after Trump fired Comey. McCabe remains at the FBI. Behind Sessions' conversations: The Justice Department is conducting an investigation into how the FBI under former director James Comey handled the Hillary Clinton email investigation in 2016. There are also ongoing leak investigations, per the same source. But even without all of these investigations, Sessions believes "Wray should have a fresh start with his own team," according to the senior administration source. Special Counsel Robert Mueller's team has been talking with George Nader, a little-known Bannon associate who boasts of his well-placed connections in the Middle East, Axios has learned. Nader has spoken with Mueller's team at least twice, according to a source briefed on the investigation. A second source briefed on the investigation confirmed that Mueller's team has brought Nader in for questioning in the past week. The Special Counsel's office declined to comment. Nader visited the White House frequently during the early months of the Trump administration. He became friendly with former chief strategist Steve Bannon, visiting his office regularly. A source familiar with the White House meetings said Jared Kushner also met Nader. After asking around about Nader, Kushner decided not to continue meeting with him, according to the same source. Sources said Nader represented himself as being personally close to Mohammed bin Zayed — the Crown Prince of Abu Dhabi and Deputy Supreme Commander of the UAE Armed Forces. But several sources who've observed Nader in action say he frequently name-drops, and that while he might be part of MbZ's extended entourage, it's unclear how influential he actually is. A number of well-connected and experienced Middle East hands in Washington told me they'd never heard of Nader. I could only find a few people who have met him. Nobody was quite clear about what he does for a living. A source who knows Nader told me he's originally Lebanese, and is now a U.S. citizen. I couldn’t reach him for comment. Interior Secretary Ryan Zinke went “rogue,” per one source. And President Trump isn’t happy about it. Two weeks ago, Zinke made an announcement that surprised the White House (and over Twitter, no less, after telling reporters at the Tallahassee airport): the waters around Florida would be exempt from his agency’s offshore oil and gas leasing program. Zinke’s announcement came shortly after he met with the state’s Republican governor, Rick Scott. Trump has made clear to Zinke that he’s angry about this move, according to two sources with direct knowledge. Zinke's decision is both legally and politically dangerous for the Trump administration. Zinke did not coordinate with anybody, and gave the White House no forewarning of his controversial action. Trump specifically asked Zinke in the Jan. 10 cabinet meeting about the drilling decision, according to three sources with direct knowledge. That exchange was not contentious. The department’s offshore leasing policies are guided by a strict process set by statute that can only take certain areas out of consideration gradually through a multi-year process that specifically weighs various factors, like environmental risks and oil and gas resource potential. By tweeting Florida would be removed just days after announcing the offshore leasing plan, and without considering any of those factors, Zinke didn’t follow the statute. That opens the administration to legal risk. Environmental groups and attorneys general from other coastal states will likely use the move to justify suing the federal government, arguing it was arbitrary and capricious to remove Florida but not other coastal states. Zinke’s move is targeting the waters with the richest oil and gas resources: the Eastern Gulf of Mexico next to Florida. This undercuts Trump’s energy dominance agenda. For that reason, former officials of the agency predict the department will try to find a way to include at least portions of it in the final plan. Zinke built a lot of goodwill with Trump before this mistake. Trump personally likes him, and they bonded immediately, according to sources who've watched them together. Trump admires Zinke for his service as a Navy SEAL commander, and has praised Zinke's deregulatory work. Trump even consulted Zinke about his Afghanistan war strategy. Bottom line: Multiple sources tell me it would be a massive stretch to say this incident has ruined Zinke's relationship with Trump. There's nothing irreparable here, though the incident has damaged Zinke's standing in the administration. Go deeper: Read Amy’s recent Harder Line column on this and another recent energy stumble of the Trump administration. As I publish this newsletter, the federal government of the United States remains in shutdown. Negotiations are fluid and moving too rapidly for me to tell you anything that will be useful beyond the next hour. There are plenty of other great reporters following this debacle, but if you follow these four you'll be in good shape. There's no point giving you Trump's — or anybody's — schedule this week. So long as the federal government remains in shutdown, everything else is in flux — including whether Trump travels to the World Economic Forum in Davos, Switzerland.